This assumes of course that you are using a variable time step. A fixed time step is always constant and doesn't need smoothing. Some people will say that you should always use a fixed time step, and there is a lot of merit to that. A stable frame rate always looks better and with a fixed time step the gameplay code behaves more deterministically and is easier to test. You can avoid a whole class of bugs that "only appear when the frame rate drops below 20 Hz". But there are situations where using a fixed frame rate might not be possible. For example if your game is dynamic and player driven, the player can always create situations when it will drop below 30 fps (for example, by gathering all the physics objects in the same place or aggroing all the enemies on the level). If you are using a fixed time step, this will force the game into slow motion, which may not be acceptable. On the PC you have to deal with a wide range of hardware. From the über-gamer that wants her million dollar rig to run the game in 250 fps (even though the monitor only refreshes at 90 Hz) to the poor min spec user who hopes that he can at least get the game to boot and chug along at 15 fps. It is hard to satisfy both customers without using a variable time step. The BitSquid engine does not dictate a time step policy, that is entirely up to the game. You can use fixed, variable, smoothed or whatever else fits your game. Each frame, we measure the time that has elapsed and use that to advance the game timer. 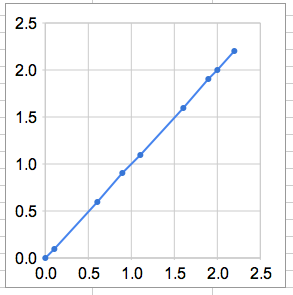 Here the dots represents the times (x-axis) at which we sample an object's position (y-axis). As you can see the samples result in a straight line for objects moving at a constant velocity, even though the time steps vary. All seems well. Oops, the line is no longer straight and there is a good chance that the user will notice this as jerky motion. If we could predict perfectly what the latency of the next frame would be, we could use that rather than the elapsed time of the last frame to advance our timers. This would compensate perfectly for the latency and the user would again see a straight line. To make a better guess of how long it will take to update and draw the next frame. Here is the same graph again, but here we have smoothed the time step that we use to evaluate the object's position. 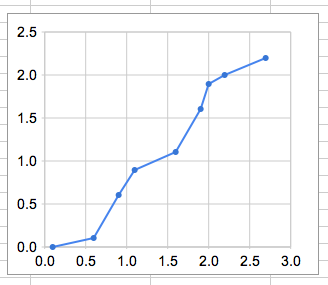 As you can see, we get a straighter line than we got by using the "raw" variable time steps. Can we do anything to improve the prediction even further? Yes, if we know more about the data we are predicting. For example, on the PC, you can get occasional "glitch" frames with very long update times if you get interrupted by other processes. If you are using a straight mean, any time you encounter such a glitch frame you will predict that the next few frames will also take very long to update. But the glitch frame was an anomaly. 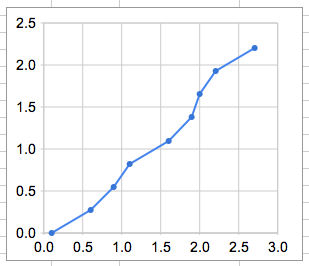 You will get a better predictor by ignoring such outliers when you calculate the mean. You could make a predictor for this. The predictor could detect if there is a strong correlation between the delta times for even and odd frames and if so, it could use only the even/odd frames to calculate the mean. But I don't recommend doing that. For two reasons. First, the zig-zag pattern is usually a result of a bad setup in the engine (or, if you are unfortunate, in the driver). It is better to fix that problem and get rid of the oscillations than to work around them. Second, heavily oscillating time steps, which you would get if you tried to follow the zig-zag pattern, tend to make gameplay code behave badly. Keep the time step reasonably stable from frame to frame. Yes, it is easy to make the update code for a single object frame rate independent in this manner. But once you start to have complex interactions between multiple objects, it gets a lot more difficult. An example: Suppose you want a camera to follow behind a moving object, but you don't want it to be completely stiff, you want some smoothness to it, like maybe lerping it to the right position, or using a dampened spring. Now try to write that in a completely time step independent manner. I.e., an oscillation in the time step should not cause the camera to oscillate with respect to the object it is following. Game play code faces many similar issues. 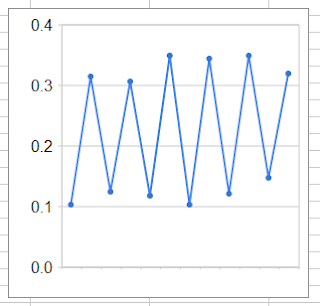 With 20+ game play programmers banging a way at the code base you can be quite certain that there are several places where oscillations in the time step lead to badly looking oscillating visuals in the game. And the best way to prevent that, in my opinion, is to smooth the time step so that it doesn't oscillate. Keep a history of the time step for the last 11 frames. Throw away the outliers, the two highest and the two lowest values. Calculate the mean of the remaining 7 values. Here is an example of the filter in action. The yellow line in this graph shows the raw time step. The red line is the smoothed time step. One last thing to mention. This calculation can cause your game clock to drift from the world clock. If you need them to be synchronized (for network play for example) you need to keep track of your "time debt" -- i.e., how far your clock has drifted from the world clock and "pay off" that debt over a number of frames by increasing or decreasing your time step, until you are back at a synchronized state. Nice post. I might try this. However, I believe you've made a slight typo: 11 - (2 + 2) does not equal 9. Ah, you are correct of course. I have fixed it. I had some fun in our last game dealing with frame time and GPU presentation time. To avoid screen tearing, we need to lock the framebuffer while it's being presented to the display hardware for the whole duration of the vsync interval. It can be done explicitly by the engine or in the driver. The engine might have a new buffer ready by the time the current vsync is done, or not. When the game can't maintain a steady rate of updates, triple buffering can be used to ensure both that there's a new buffer available for the renderer and that the buffer already presented is left untouched. This adds a new layer of uncertainty in the determination of the duration the frame. It's not uncommon that a frame prepared to last 33ms ends up being displayed 16ms, while the next frame prepared to last 16ms ends up being displayed 33ms. It's easy to make that happen if the graphics rendering time is used as game update step increment which a lot of games tend to do. Your description of what happens next was spot on. Trying to account for that is really really hard even on a controlled environment like a console. I experimented with multiple ideas on God of War 3. The first thing to know is that our PPU, SPUs and RSX had a relatively lose synchronization between each other, they could each slide by 16ms easily. It allowed for some cost amortization. So our CPU time is pretty much independent of our graphics time. Yes, it's a tricky thing. Especially since the "smoothness" or "jerkiness" is really hard to quantify. There is not much you can do except to play the game and see what "feels best". I should probably add that this entire article is an after-the-fact-rationalization. I'd noticed that our games felt better with a little time step smoothing and then I sat down and thought about why that would be so. Hey Niklas, I know this blog is old but I absolutely love it! I ended up devoting the last month straight to logic update and time smoothing debugging so it was a joy to see this (I almost thought it was some kind of hallucination) I'm still having some troubles though. Is there any place you know of for more info like this? What kind of lerping do you do between the timestep and mean timestep and how do you keep track of time debt? I'm trying to develop a good method to smoothly pay the debt without just nullifying all the smoothing I've done so far. No sorry, I don't know any other place to find out information, I'm just writing down what I have thought about for myself. Where p is the weight of this timestep... a value of p=0.2 is perhaps good, but all this is experimental anyway. So when ever I take a smaller time step than the elapsed, I acquire debt and I pay it back when I take larger timestep. Here maybe f=0.1, depending on how quickly you want to pay back your debt. Again, you need to experiment. For doing the time debt and removing the outliers, you could change it to a weighted moving average(where the weighting is determined by time debt and the delta between the mean and current value). Yes, there are many different ways of doing this, and hard to say what is right, since it depends on how you want the game to FEEL. In the BitSquid Tech we have a function set_time_step_policy() that gives detailed control over exactly how the time step is smoothed. I've given this a lot of thought, and delta time is fundamentally a flawed concept because information about how long the previous frame took isn't useful in determining how long the current frame will take. No matter how much you smooth it. You are correct that fixed time is better but you still face the problem of behaviour when that time isn't met being undefined. The solution that I've dreamed up is this: predetermine frametimes. You set a target for how long a frame is going to take before generating it, and ensure the frame takes exactly that long. Mainly you look at how close the previous frame was to overshooting and increase the target frametime by some threshold. Likewise you would decrease the target frametime if you have too much wasted time. This still leaves unexpected spikes however, but you can deal with those using a timer based interrupt that enforces the target frametime even if the frame overshoots. It would cause tearing but the time domain is completely preserved in all cases. You could also maybe do some sort of dynamic quality adjustments based on performance estimates but that's a little more advanced and maybe not desirable. an internet connection. It ensure comfort Bsnl speedtest.